That’s the title of my new book due for release in the coming months. It’s been a collaboration project since 2012 between myself, Dr Jeffrey M Schwartz, leading Neuroscientist on OCD and neuroplasticity at UCLA, and Art Kleiner, editor for s+b magazine. The book will be published by Columbia University Press. This is a coming together of our work and specialisations in business strategy, neuroscience and coaching into one central space. This body of work will essentially show and enable leaders how to access a profound and empowering resource that is available to us at any time, called the Wise Advocate. Essentially, recent advances in neuroscience have enhanced our ability to understand the inner awareness that leaders often neglect. Have you considered how potentially empowering it is to equip leaders from the inside out to make wise decisions and more effectively influence and collaborate with others? We believe that the most powerful resource is that aspect of attention we call the Wise Advocate, which represents our approach to the practical application of mindfulness in the workplace. 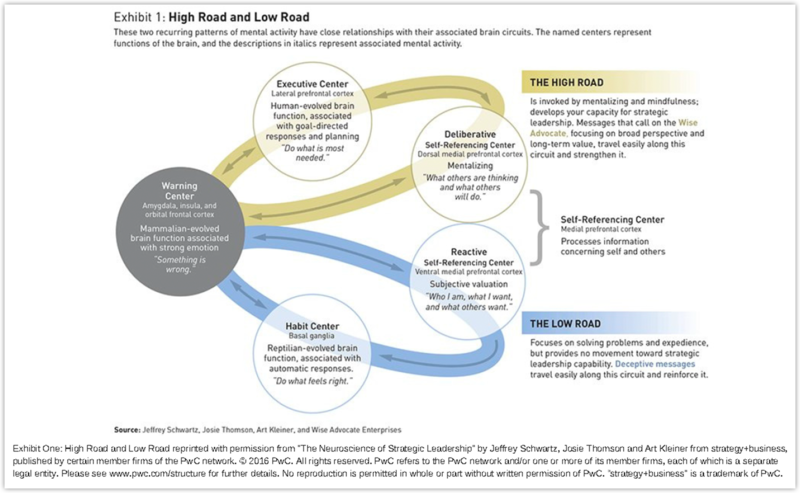 The High Road pattern of mental activity uses a functional centre of the brain we term the Deliberative Self-Referencing Center. This function is activated by questions like “What are others thinking, and what will others do?” These kinds of strategic questions are described by neuroscientists using the term mentalizing: What is he/she thinking, and what will he/she do? These questions are typical of High-Road thinking. Over time, this practice gives them a greater facility for wise leadership, the kind of leadership that allows people to navigate large organizations with a Wise Advocate frame of mind toward seemingly impossible goals. If you’d like to express your interest in being advised when the book is available for purchase, click here or fill in the form below. If you’re interested in licensed trainings for your organisation, click here or fill in the form below. If your career is at a cross roads and it’s time to reconsider your path, take a look at my new online learning program Career Transitions. Express your interest here to be advised as soon as the book is available for purchase, and/or your interest in licensing our work for implementation within organisations. My co-authors and myself will be available for presentations and workshops for organisations interested in exploring ways to cultivate Wise Advocate leadership. There will also be opportunity to license our programs soon. Please select...I would like to be updated about the availability of this book.I am interested in licensed trainings for my organisation.I am interested in both the book and licensed trainings.